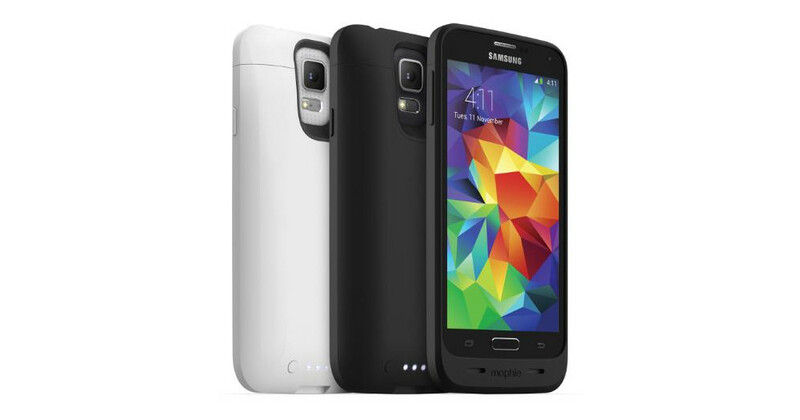 Mophie, leaders of all things attachable battery packs, announced today the availability of the Juice Pack for the Samsung Galaxy S5. I’m not exactly sure why it has taken them six months to make this available, but hey, it’s coming! Potential buyers can pre-order the GS5’s Juice Pack today for $99.95 at Mophie’s site with an expected ship date of September 8. What is a Juice Pack? Put simply, it’s a case with a built-in battery pack. Mophie has made a living and name for itself by creating these cases for the iPhone, since iPhone’s don’t have removable batteries and people often need to charge throughout a day. But they have also found some success on Android, even though a handful of Android devices (like the Galaxy S5) have removable batteries that can be easily swapped without the need of a massive battery case. With a Mophie Juice Pack attached, users can expect up to 100% extra battery life. This particular Juice Pack is “armed with” a 3,000mAh battery and USB 3.0. If you need extended battery life throughout a day and do not feel like hot-swapping a fresh battery every time you run low, think of Mophie.